Tracy, over at Fly On Over had a great idea for a blog hop- a day in the life of a working amateur! What a fun idea to get a look into other people’s days. Each of my days is different (depending if I ride that day or what is on my office schedule) but since this is my horse blog I will do a day that I ride. 7:30 A.M.– Alarm goes off, groggily roll out of bed, walk into the kitchen and turn on the Keurig. Make a cup of green tea and oatmeal, sit down in front of laptop and cruise Facebook and Instagram while I eat breakfast. 8:00 A.M.- Wash and moisturize my face, let that soak in while I blow out my hair. Put on my make-up. 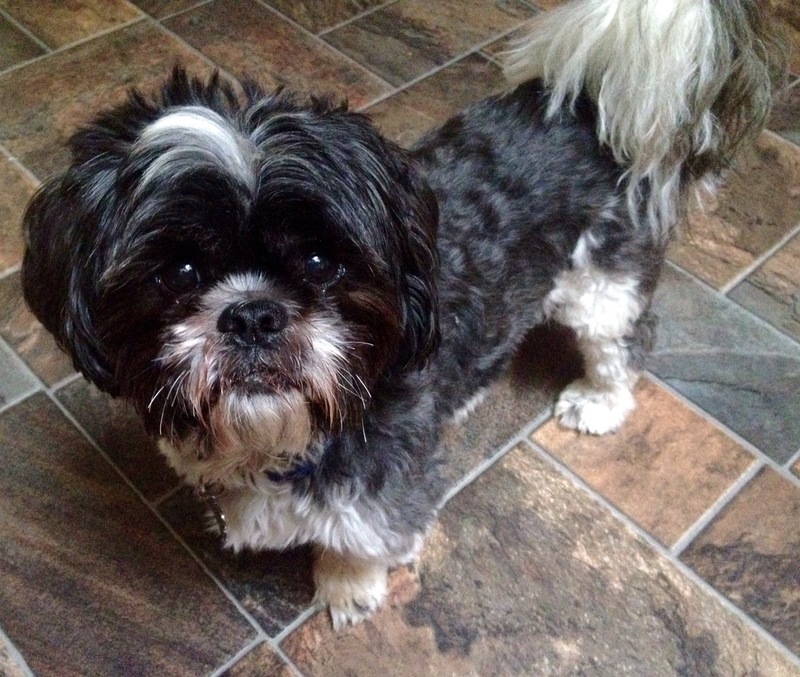 8:30- 8:45 A.M.– leave the house somewhere within this window of time, depending how slowly I did the above or how many times I stop to pet Tucker and tell him how cute he is. 9:30-11:00 A.M.- check my file quickly before I get out of the car to see which Judge’s courtroom(s) I have to go to, power walk to said courtroom, sign in, sit and wait and read my Kindle until the other lawyers get there on my cases, attend a Court conference, meet with the opposing lawyer(s) on my case(s) (depending how many I have scheduled for that day). 11:30 A.M.- Get back in the car, eat a protein bar because I am STARVING at this point. Head back to office. 12:15 P.M.- Arrive back at the office. Check my mailbox on the way in, make a cup of green tea, sit down at my desk, check voicemails and emails. 12:30 P.M.- Pull any files/draft any documents needed to return any phone calls and emails. 3:00 P.M.- Snacktime because by now I am STARVING again. Depending how healthy I feel I either have a protein bar or have something from the kitchen (which is always stocked with candy, Entenmann’s cakes, bagels, and other random baked goods) Then go back to doing everything again. 5:30 P.M.- eat a protein bar in the car on the way to ride, or stop for pizza depending how hungry I am or how late I am running. 6:00 P.M.- Arrive at the barn, change into riding clothes and grab Mabou from the paddock, tell him how handsome he is, groom him and tack up. 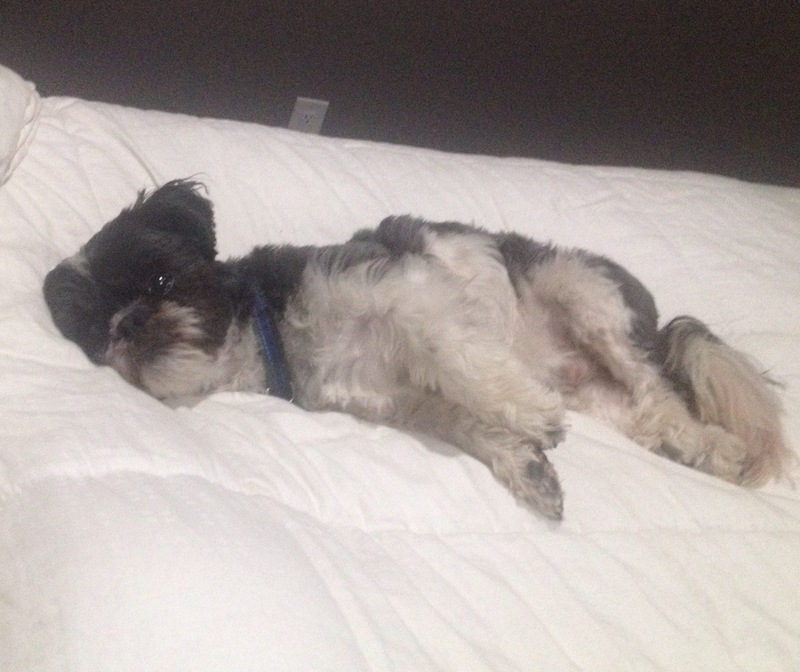 6:30 P.M.– I am in my happy place! 7:00 P.M.- Untack Mabou, feed him treats, groom him and turn him back out. 7:30 P.M.- put away all my stuff, head home. 7:45 P.M.- Arrive home, eat something and hang out on the couch with hubby until we get tired and go to sleep to wake up and do it all over again. Very fun right?! NOT lol but I am very fortunate my job isn’t so bad and it allows me to afford having a horse and doing what I love! If you could choose to do ONE THING on horseback, both in general and on your own horse in particular, what would you do? What is your FAVORITE thing to do on your horse? For me, my favorite thing to do in general is jump! It is a lot of fun figuring out how to ride each horse to the fences to make everything work smoothly and try to nail all of the distances. Although I love doing so many things on Mabou my ONE favorite thing to do is to gallop open fields. He has such a massive effortless stride that he eats the ground and it is the best feeling in the entire world. You literally feel like you are flying. I can’t not smile when I have to space to allow him to open up and gallop. Thanks to L over at Viva Carlos for December’s 10 questions! 1. What size horse do you prefer to ride? I feel safest on large ponies, but I like jumping big horses better, like Mabou, who is 17 hands. The jumps feel smaller! 2. Do you school in tall boots or half chaps and paddock boots? Half chaps and paddock boots. 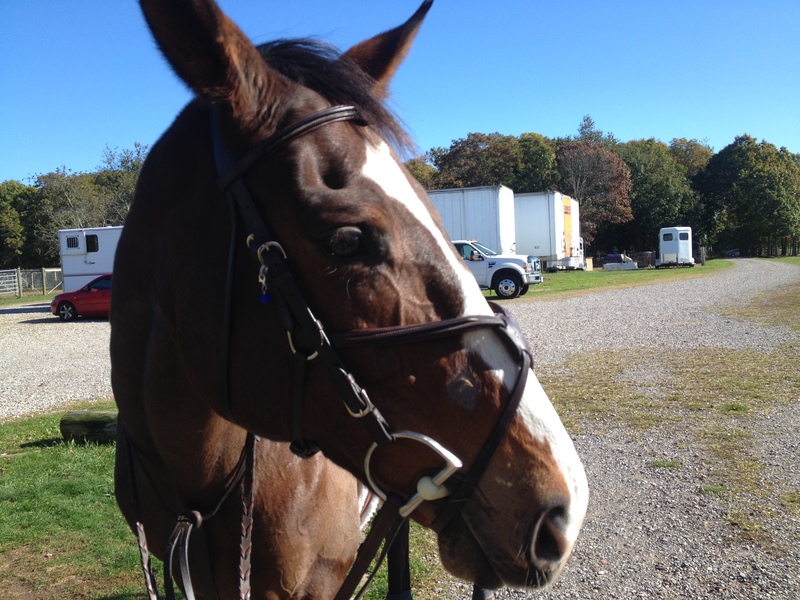 The tall boots only come out for shows, hunter paces, and fox hunting. 3. What do you do with your ribbons after shows? Hang them in my kitchen until hubby moves them and they end up stuffed somewhere. 4. 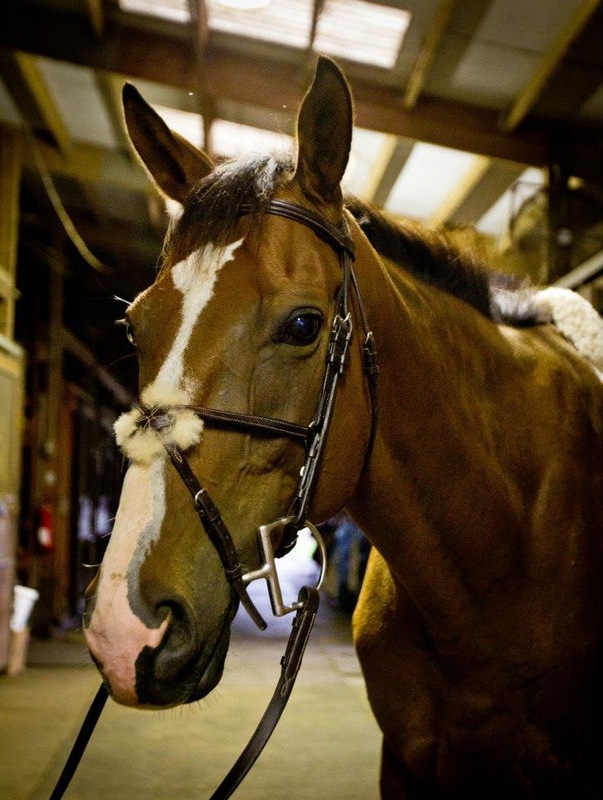 Do you ride/board at a large show barn or a small private barn? My barn is a medium size facility with one trainer and probably around 30 boarders. 5. Have you ever seen a horse give birth? Yes, when I was 7 or 8 so I don’t remember much. 6. What is your favorite breed? This has changed since I got Mabou, I used to love warmbloods but now I love my TB, he has so much heart and “try”. 10. How often do you go to the tack store? Probably once every few months. Most of my horse related purchases are made online. 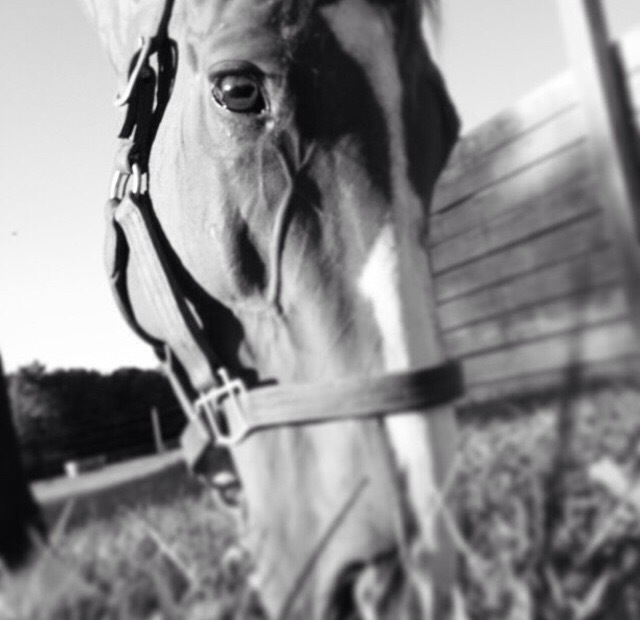 Equestrian Journey Blog Hop: What will you NOT do? This is a great Blog Hop, as usually we are always posting about the opposite! While I am sure there are a lot of small things I will never do, such as enter a stall with a horse I don’t know and cross-tie a horse to their bridle, the biggest one for me is I will never do anything on a horse that I do not feel comfortable doing. At this point in my life, I am not out to prove anything, and if I feel unsafe on a horse I GET OFF IMMEDIATELY. There have been days, when Mabou was first off the track, where he was acting up and leaping and I felt the situation escalating and I just got off and called it a day. There is always tomorrow. I also now have no trouble whatsoever saying “no” to my trainer if I really don’t feel comfortable doing something, where when I was younger I probably would have just done it anyway. 1. Have you ever owned a horse? 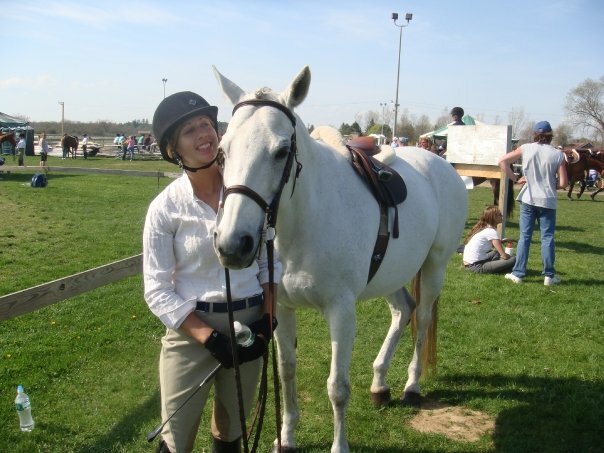 Yes, my mare, Crystal that I owned from age 11- 25, and my current horse, Mabou. 2. What is your favorite aspect of your discipline? I love the grace and elegance that is present when a horse and rider are really working in tune with each other. They make it look so easy, yet we all know that it is far from easy! 3. What pet peeves do you have concerning your discipline? There are going to be issues in any discipline and any sport. I hate to see any horses mistreated across the board, no matter which discipline they are part of. 4. Do you do barn chores? Basic ones, like sweeping up after myself and cleaning the wash stall after I use it. 5. What is your least favorite barn chore? Filling hay bales for the trailer!! Hay gets EVERYWHERE. 6. What do you consider the worst vice in a horse? I can’t stand horses that bite. 7. What saddle brand is your favorite? I had a Tad Coffin for Crystal that I LOVED, but Mabou hated it so now my current favorite is my County, which feels like it was made for me (well I guess that’s good, since it was lol). 8. Do you ride with a quarter sheet in the winter? When it is very cold, yes, I think it keeps my horse more comfortable, and I like being able to put it over my legs during cool down. Unfortunately for Mabou, I have a very nice quarter sheet that is embroidered in pink with “Ice Princess” (Crystal’s show name), and since it is so nice, he now gets to wear it! 9. Does your horse wear boots? What kind? Does he ever! I have two pairs of front and hind Eskadrons, one is the standard flexisoft ones, the other is the memory foam, Leather Mondega front and hind boots, Thinline front and hind boots, Equifit front boots, Eskadron cross country front and hind boots, two pairs of the Beval pull-on bell boots and one pair of the Eskadron Velcro bell boots. 10. Full seat or knee patch breeches? Knee patch, I used to wear full seat when I did more dressage but have no need for the extra grip now. 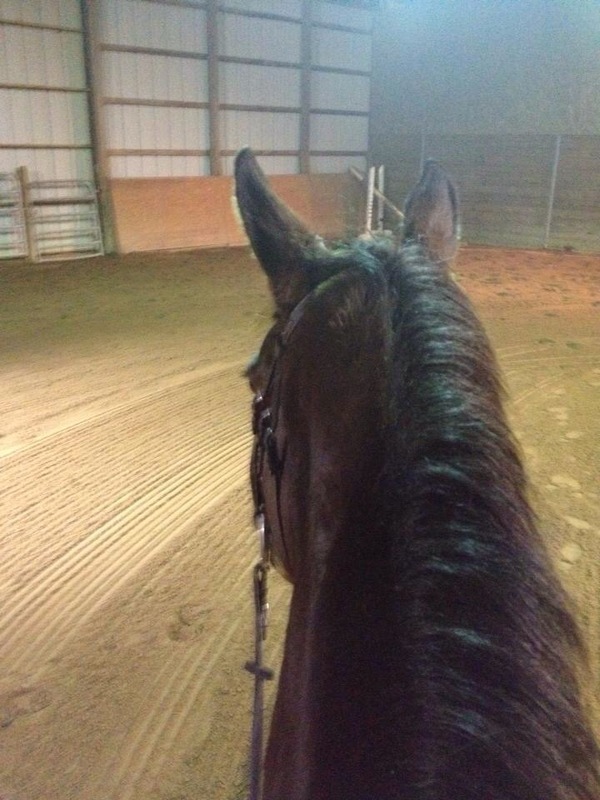 Hand Gallop Asks: What do you do to stay fit to ride? I used to be big into running, I did a lot of races, 10ks, half marathons, you name it, UNTIL I started working full time and realized that life after law school didn’t really have enough time to take long training runs. I then did the whole kickboxing and spinning classes at the gym thing but they were a.) expensive and b.) not always at the best times for me. Plus I would have to arrange my schedule to attend the class at it’s set time, which doesn’t allow much for flexibility, something I realized that I need. What now works for me is 3 days a week of strength and endurance training and 2 days a week of Pilates (Note: this is what I AIM for, but sadly it doesn’t always happen). I try to do the Pilates on the days that I ride, since after I get home from riding I am usually tired from a long day and not too eager to break a huge sweat. My workouts are thirty minutes or less, and I have found that this is short enough that it is “do-able”, as thirty minutes is not intimidating at all and is over fairly quickly. I have been doing the workouts from CrossTrain, a gym program run by a husband and wife team where you pay $19 a month and there is a new workout video uploaded every single day. It keeps it interesting and fun. I actually look forward to checking what the daily workout is each day. And surprisingly, now that I spend the least amount of time working out that I ever have, I am easily in the best shape of my life and the smallest clothing size I have been since the end of high school. Win-Win!